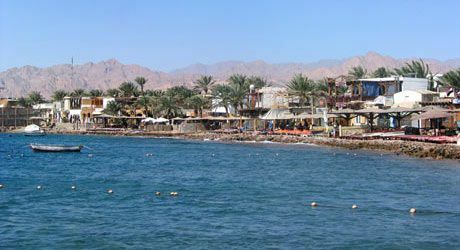 The Dahab Oasis is situated on the east coast of the Gulf of Aqaba, about 80 km from Sharm el Sheik (international airport). The district Masbat represents the tourist center with a wonderful beach promenade, a wide choice of cafes (with internet connection) and restaurants right at the ocean side which are very inviting to stay a while. Here you will also find coral reefs, which are among the finest in the world, ideal for swimming, snorkeling and diving. A lot of diving school offers can be found locally, which also cater to beginners. You can rent diving fins and goggles as well as anything else you might need to take to the water. I myself also offer introduction courses into snorkeling and/or will be glad to show you around the beautiful coral reefs. In the Sinai, the tourist season lasts all year round. January to March are the so-called “cold” months, when it is pleasantly warm during the day (20 to 30° C), but cools down considerably at night, especially in the desert (down to 0° C). In April temperatures begin to rise and then at night in the mountains it will not be that cold anymore. If during the day you find yourself a nice spot sheltered from the wind, you will usually be able to enjoy a sunbath in the winter months as well.